Last year, I decided to sign on as a retailer for American Paint Company. When I got my first shipment of paint I was like a kid in a candy store! I was dying to paint something so the first day I painted a tray with Liberty. Super smooth and lush and it covered in one coat! I almost couldn’t believe it. It dries super fast and is VOC free so there are no odors. After finishing the tray I had to paint something else. I was dying to use Fireworks Red. It looked so bright and vibrant in the can, I couldn’t wait to get it out. 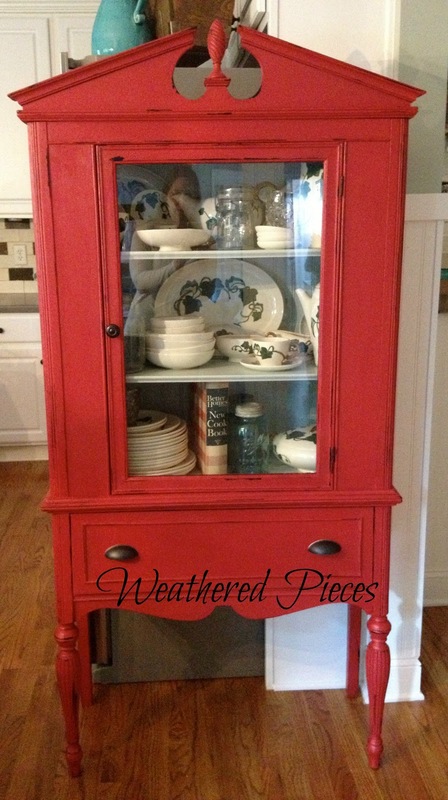 While I was sitting at the kitchen table it hit me that I could repaint this china cabinet that has been in my family since I was a little girl. I had painted it a few years ago with black spray paint. It needed a lot of work and it was one of the first pieces I had redone. This was right after I brought it into the house, you can see how much my kitchen has changed and the gray fur ball in the right corner is my kitty that is no longer with us. 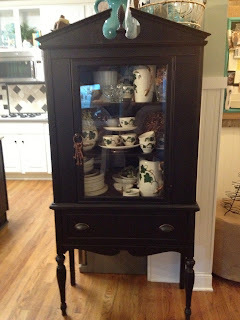 I loved it black but after redoing the kitchen I decided it was too dark and was originally going to paint it turquoise. I am so glad I waited because I think the red is perfect! 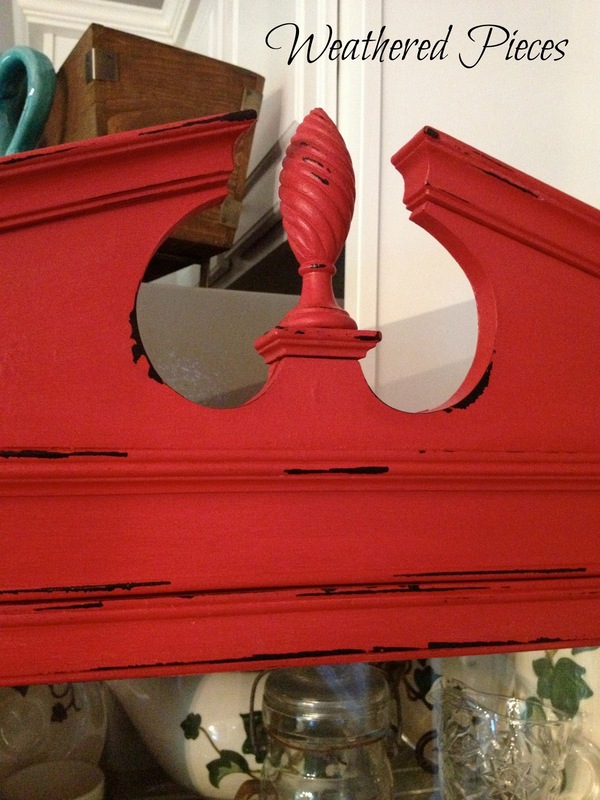 This is a true gorgeous, vibrant red and I am so happy I didn’t paint it turquoise! I used Liberty inside. I think the lighter color makes a huge difference! I love distressing. Lots of it! I really love chippy, peely paint. My daughter didn’t think I should distress it, so I asked my Facebook followers. Most said to distress, which I had secretly planned on anyway but I am trying to get away from distressing everything. I love this shot with the Better Homes and Gardens cookbook that was my Grandmother’s, along with some of the Metlox dishes. 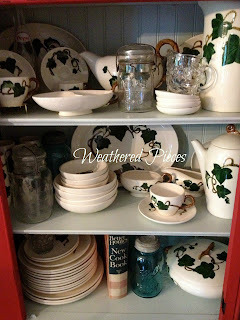 This is her pattern but most of these I found on ebay, at Goodwill and at auctions. Even though most of these aren’t hers, they still bring back good memories every time I see them. It’s been over a year now that I have been selling American Paint Company, and I can say, I love it even more now! 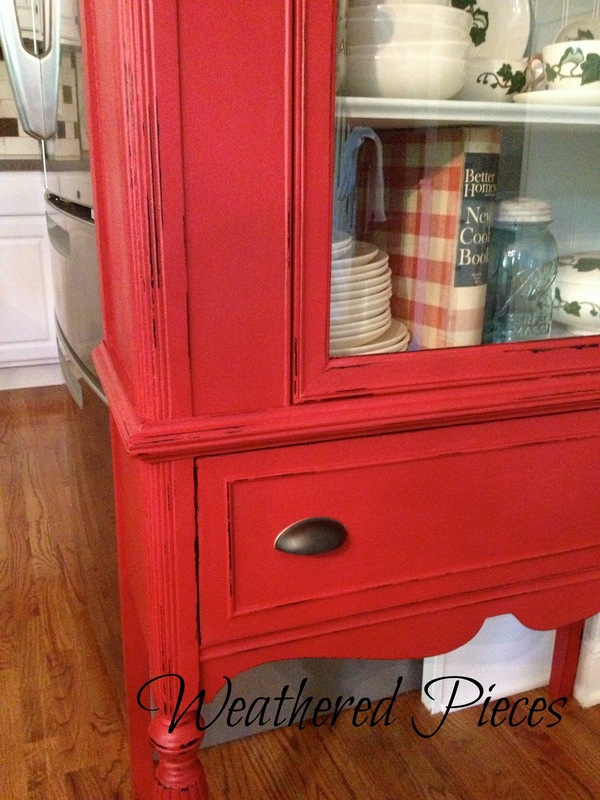 Love the red you ended up picking! Looks perfect!